Kieran and I went back to Mount Diablo on Sunday evening, just a few days after taking his grandparents there during the week. We went to the same area, just inside the north border of the vast park, where Burma Road trail crosses the street heading up the mountain. We eschewed trails and instead followed the bones of dry Little Pine Creek up into the hills. In this drought summer, the creek bed is dry and easy to follow as a trail, so long as you keep an eye out for poison oak and dodge it. Late in summer, some of the tricky poison oak branches have shed their telltale leaves and only dangle a few white berries. “I didn’t know poison oak had white berries,” Kieran said after I pointed them out to him. We hiked mostly on the dry stone bones of the creek, sometimes swishing through drifts of fallen yellow leaves from California Buckeyes (Aesculus californica) or wading in a rustling “stream” of vivid red Bigleaf Maple leaves (Acer macrophyllum). Most of the fallen leaves in the area were from our local oaks (Quercus), which are a dull brown. Where the leaves pile up they hide the rocky bed of the creek, so we had to step carefully. “In leaves no step had trodden black,” as Frost put it. We certainly were on a road few people had ever taken. I’m glad he saw it, since I was just blundering on and would likely have clambered right over its den. The little Mephitis mephitis raised its tail at us a few times, but we kept our distance and let it calm down. 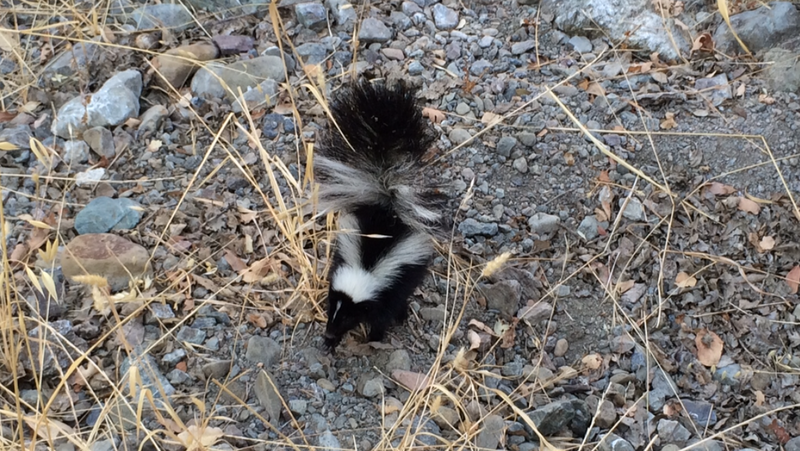 On our way back down the mountain an hour later, the skunk had emerged from its den and was foraging actively in the dry stream bed, poking about the stones for grubs or insects to munch on. We detoured carefully around it, while getting a good look, too. 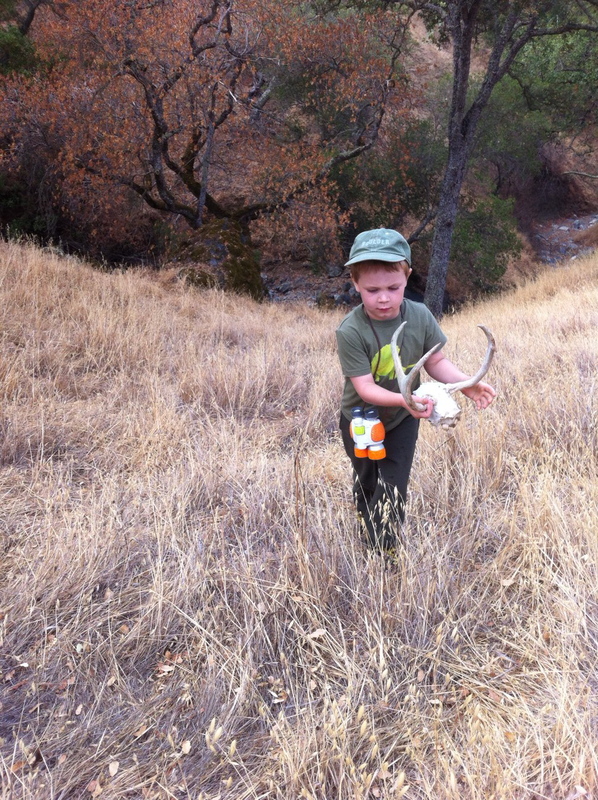 Our main goal for this trip was quickly achieved, as we began finding many bones among the dry creek’s stones. 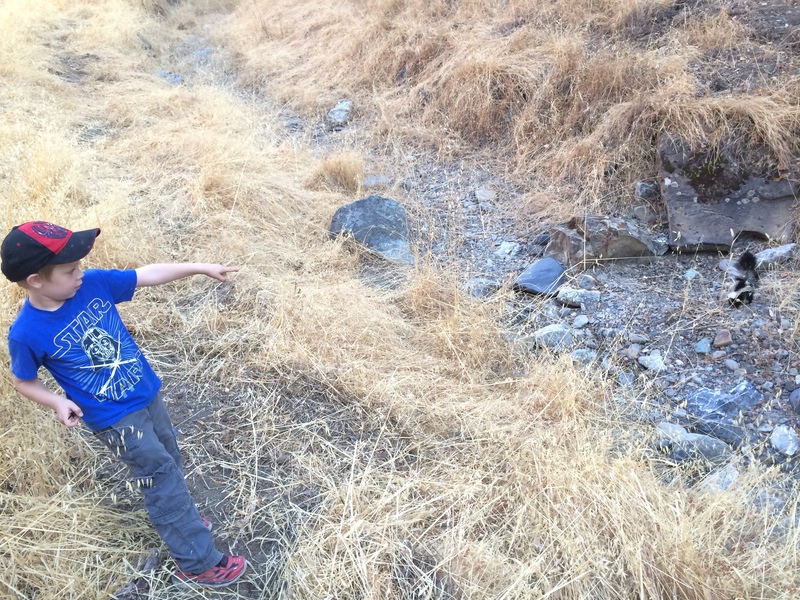 We hypothesize that winter rains wash bones down, down, down the steep hills into the stream beds, and so far, our experience confirms this. 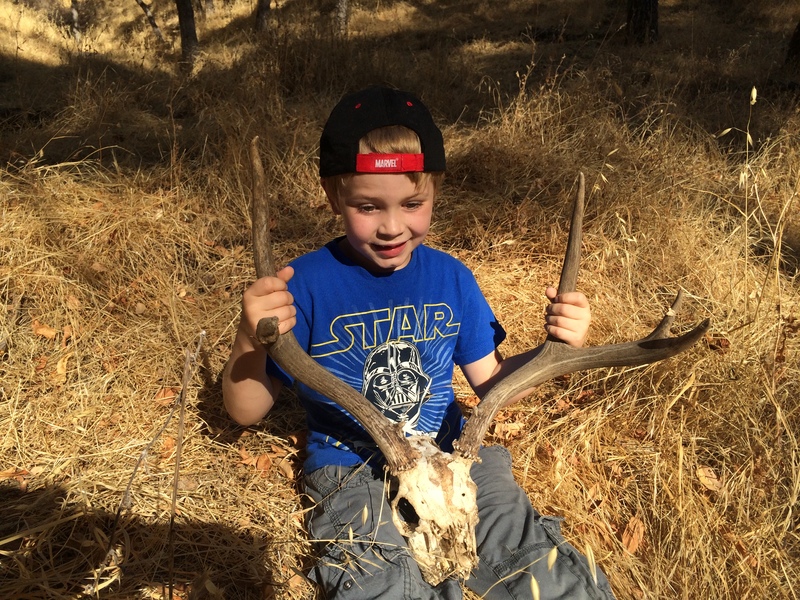 After finding a mandible and a few long leg bones of our local mule deer (Odocoileus hemionus), we found a cranium with most of its teeth intact and huge antlers still attached. Kieran carried this enormous skull and rack with him on the rest of the hike, lugging it carefully up and over the various dry cataracts we scaled. 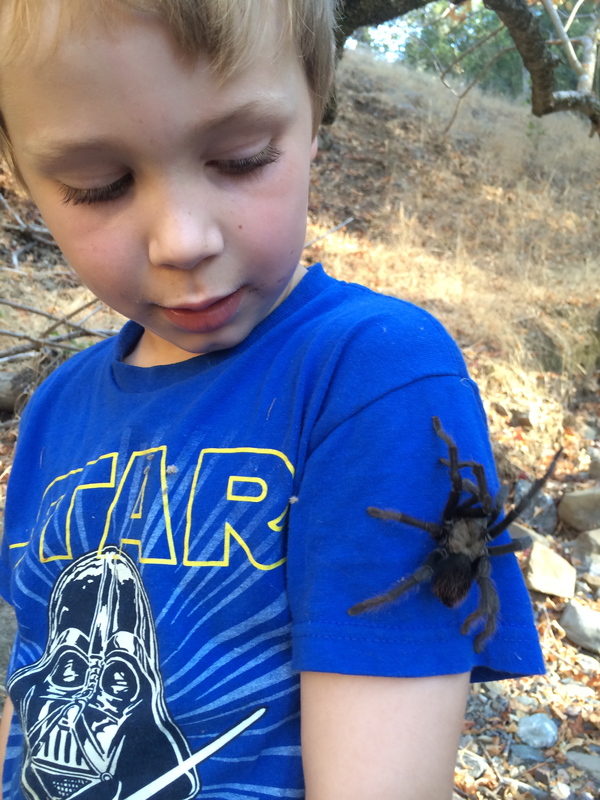 Just as we did the previous week, we found a male tarantula wandering through the forest and took some time to say hello to him. 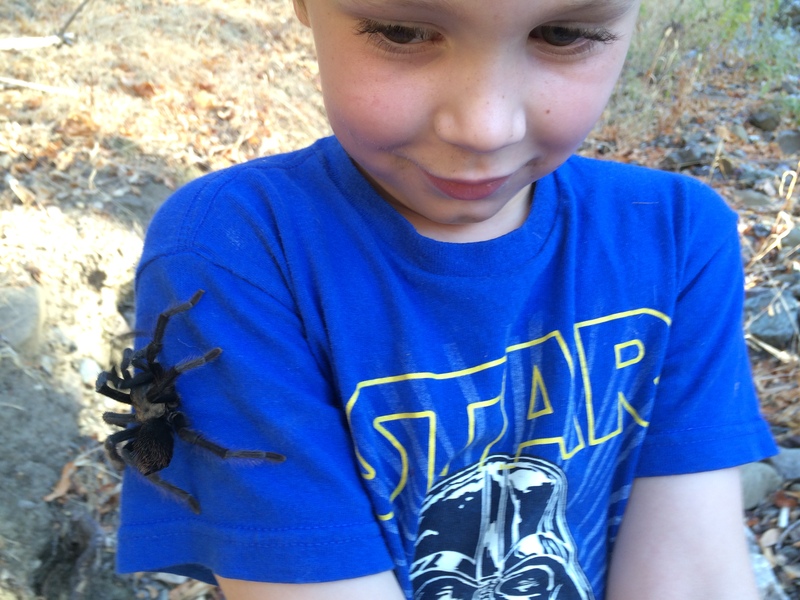 Two tarantulas in a week is a pretty good record! He spotted an ant colony dug right into the dusty floor of the creek between some stones. The tiny red ants with black gasters were swarming out all over the place in a most unusual fashion. At first we thought this might be another weird swarm of the tiny red Neivamyrmex army ants like those we found in Briones last year. But the black gaster didn’t fit with that genus, which seems to be all red. These ants were as tiny as our ubiquitous, invasive Argentine ants (Iridomyrmex humilis), but were fierce, and their bites or stings really hurt! They were so tiny I couldn’t tell if they were stinging me, or biting my skin and spraying the wound with formic acid, as some ants do. The swarm contained several winged queens, and we realized that, although no rain had fallen, this was a mating swarm. The virgin queens emerge and fly up to mate with winged males before dropping to earth and shedding their wings and starting a new colony. I tried to get a good look at one of the queens with my little jeweler’s magnifying loupe, but the tiny, fierce workers swarmed all over my hands and legs and they hurt! So I brought home a handful of workers that Kieran cleverly caught on a dry grass stem, which we popped in a plastic tube with a lid. We’ll examine them later under our microscope and try to determine their genus. 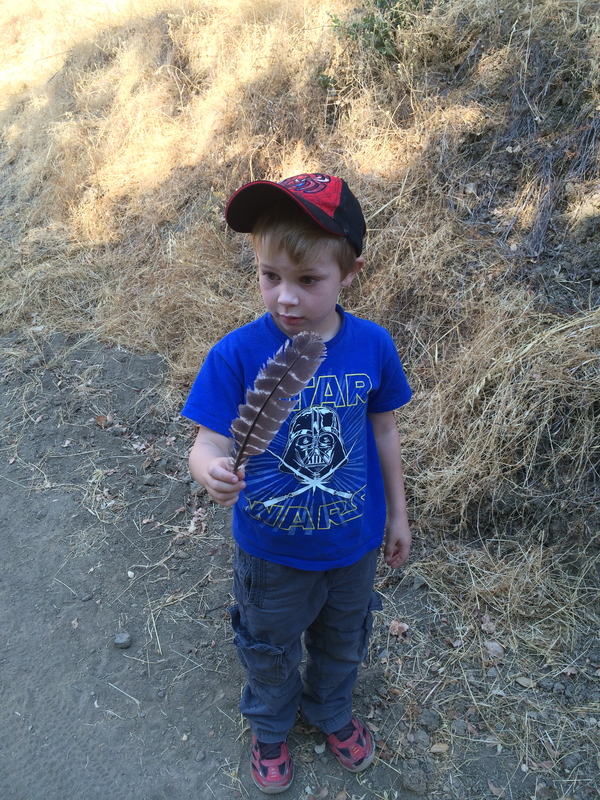 Kieran collected feathers as we explored, mostly from wild turkeys, whose dinosaurian footprints were visible in the dust of the trail. 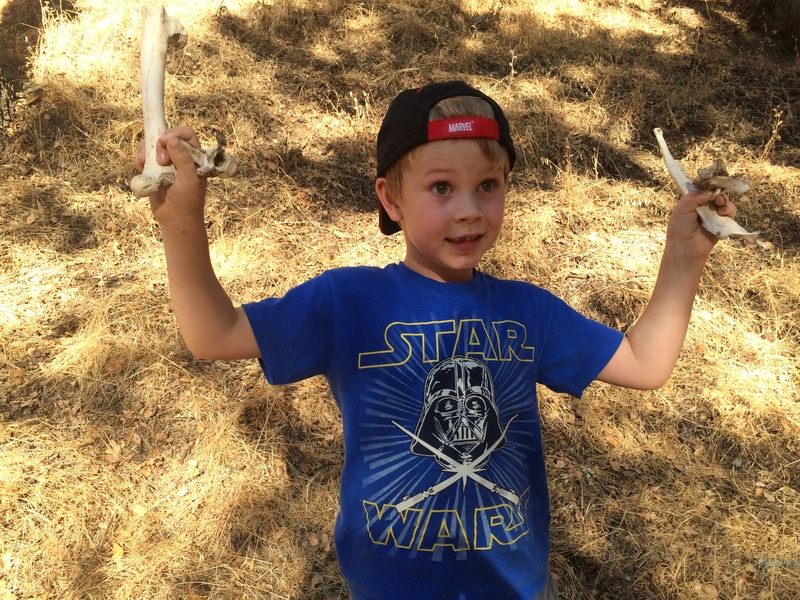 The purpose of our expedition was to look for bones. After finding this, Kieran declared he wanted to be an osteologist. 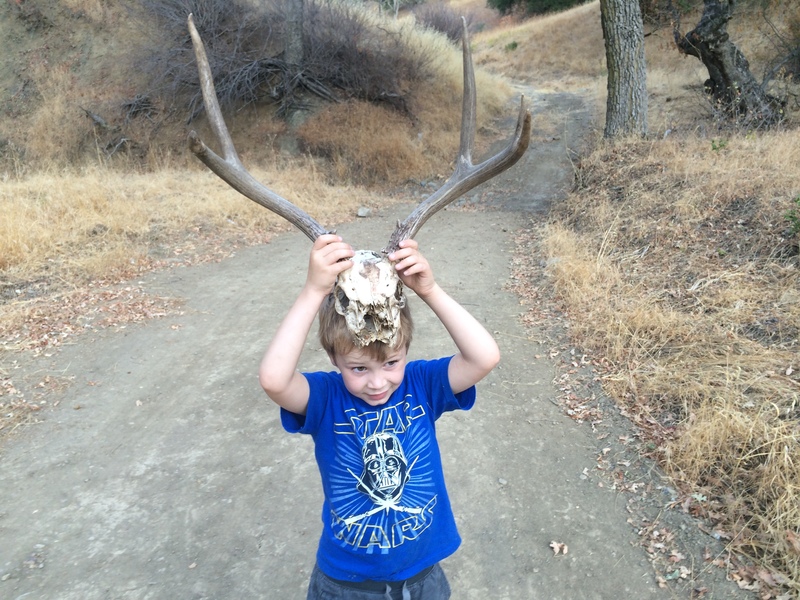 This isn’t the first deer skull we’ve discovered on Mt. Diablo. We found another several years ago. 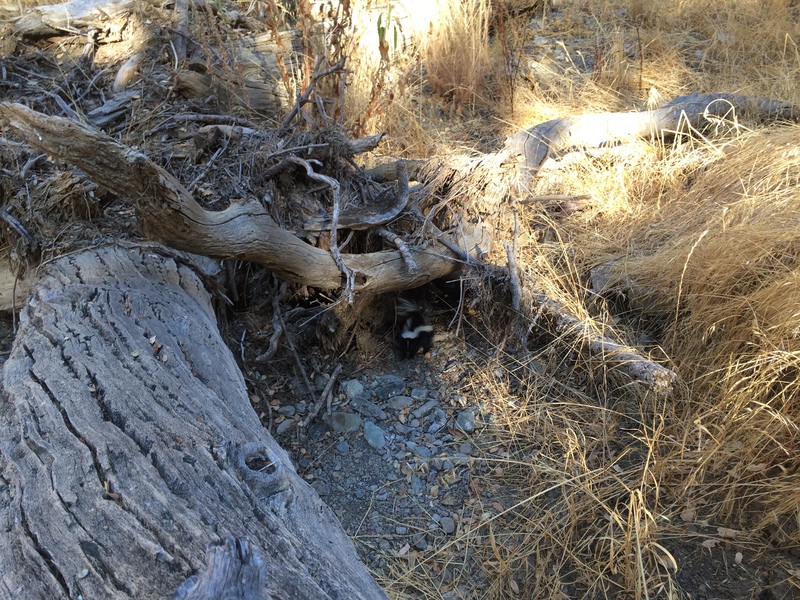 A striped skunk in its den. With his sharp eyes, Kieran spotted the skunk before I did. 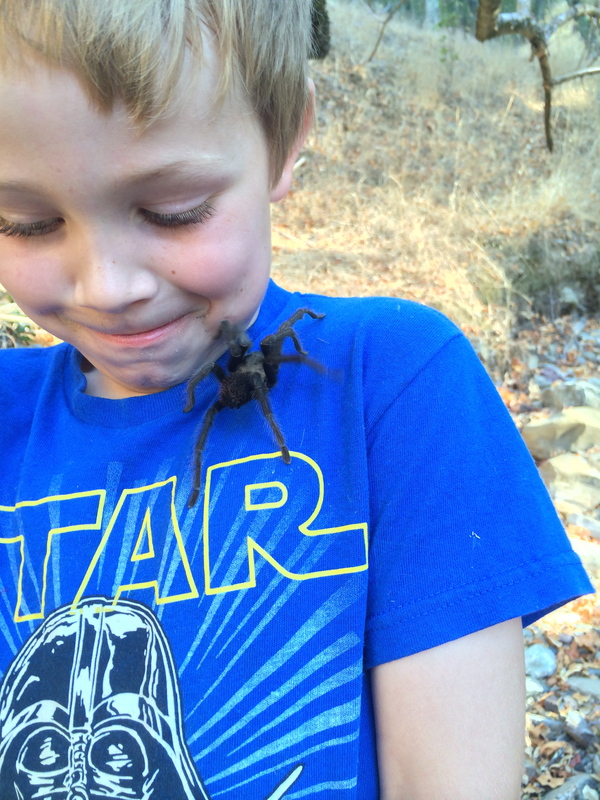 We found another wandering tarantula. The tickle of a tarantula! Trying not to laugh (or scream).